A mobile website is similar to any other websites that are built on browser-based pages supported by HTML and the CSS standard. Mobile websites are designed for small-size screens using media queries (defining separate design property) and also some of them have specific features for mobiles like click to call or location-based functionalities. But again people do not want to open a browser, type in a URL and wait for data to be rendered them in the browser. They rather want to use a mobile application which they can download once and use whenever they want. There are three options for developing a mobile application namely Web, native and hybrid applications. A mobile app is the best of both worlds – native and web apps. Hybrid apps are becoming famous amongst the developers because they have to code apps for once and then run them on any platform with no extra coding. Ionic is an open-source framework for HTML5 mobile applications that can be implemented for hybrid mobile application development. In addition, it also supports HTML5 and CSS3 friendly modern browsers. 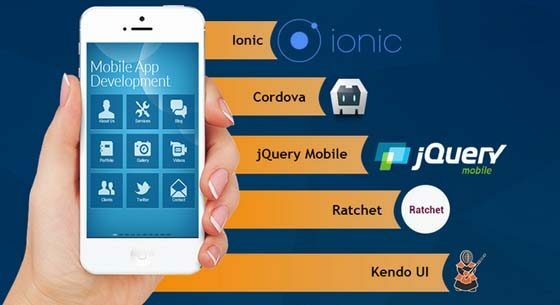 The startup application is provided with some template options which a developer finds easy to get started with Ionic is widely considered as the pioneer of mobile app frameworks.It requires no third-party integration with JS library. To make a big interactive app, it can be clubbed with Angular.js both frameworks together work very well. PhoneGap is one of the most widely used frameworks, based upon Cordova. Mobile’s general inbuilt functions like camera, location, contacts etc can be connected with collections of APIs. PhoneGap community also has an incredible support team. Onsen UI works great with Monaca. Monaca offers a powerful command-line tool and desktop app to simplify complicated tasks. You can also use the Monaca Debugger to test your apps on the device, including live-reload to help speed up your development. And when you’re ready to release, Monaca builds your Onsen UI app in the cloud, ready to upload to the app stores.